This is a painful anniversary for the working class. In February 1984 miners at Manvers Colliery walked out over pit closures which had been looming since Ian Macgregor had been appointed Chairman of the National Coal Board a year earlier. They were joined a few days later by men at Cortonwood and Bulcliffe Wood collieries after pithead ballots. It sparked off a strike. First, throughout the Yorkshire coalfield, then across the country. Macgregor lied that he only wanted to close 20 or so pits. The NUM said 70 was the target. Documents released this year show the true figure was 75. It was the first lie in a campaign of lies maintained by Government and press throughout the strike. But the miners were still confident of victory. After all they had not lost a big strike since 1926 and the strikes of 1972 and 1974 were still fresh in our memories. Had they not already made Thatcher back down over pit closures in 1981? They knew about the Ridley Plan (published by the Economist 5 years earlier) and they were aware of the changes in their circumstances. By the time the strike started two million manufacturing jobs had been lost already. Coal imports from Australia, Colombia and Poland had increased. Many power stations had been converted to gas. Coal transport on the railways had been run down and replaced by small haulage contractors’ lorries. 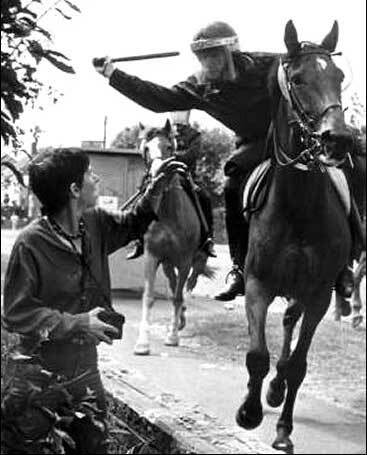 They knew too that the power station workers and police had been given big pay rises just before the strike. What they did not know was that the leaders of the EEPTU (electrical trades union) were also advising the Thatcher Government on how to break the strike. The TUC and the Labour Party sided with Government calls for a national ballot (ignoring the fact that pithead votes had taken place throughout). The steelworkers union (ISTC) refused to take solidarity action (despite getting such solidarity from the miners only 3 years earlier). Bill Sirs their leader became a good friend of the Thatchers. In fact the unions put the national interest before their members’ interests. The mood had changed in Britain after the Falklands War. The quick victory with only 225 British deaths turned the Thatcher Government from the most unpopular in history to a landslide election winner in June 1983. The smell of jingoism was in the air. The Sun even headlined one article “Call off the rail strike or we’ll call an air strike”. The miners’ walkout was no simple knee-jerk reaction. They had operated a work to rule for months and months to get pithead coal stocks down but without much success. However, Macgregor’s announcement in March of the scrapping of the 1948 Coal Board agreement provoked a response. Starting a strike as Spring appeared was not exactly the best time to start. One of the strengths of the miners was that they lived where they worked. Pit villages were fairly self-contained and isolated whether up Welsh valleys or in the Northern countryside. It was the strength of solidarity which enabled the strike to endure so long in the face of so much hardship. Thatcher was incandescent when she found that building societies in pit villages refused to foreclose mortgages. Her theory that having a mortgage in a “property-owning democracy” would prevent anyone from striking went up in smoke when a building society’s only customers were miners in one village. But the seemingly clever slogan “Coal not Dole” which sprang up from the earliest days of the strike was a double-edged sword. It implied that the strike was only about miners’ jobs. In fact, as we wrote repeatedly at the time, it was about all our livelihoods. And what was needed was more than token solidarity. By January 1985 it was already too late but there were some possibilities for this call to be heeded especially in the summer of 1984. Despite being threatened with the sack many rail workers refused to transport coal to power stations. In August a proposed dock strike (also about job losses) would have cut coal imports but it was called off at the last minute by the union (and the dockworkers own misery would soon start up). In the same month [we now know] with the pound and stock market falling the Conservative government was also thinking of backing down, but when this crisis passed they hung on. What was then visited on the working class after that in terms of “restructuring” is only too well known. There is no point in looking back in anger or impotence. The past is the past and we cannot relive it. We have to look to the future and if humanity has a future it is one without the class antagonisms of capitalism. Since the current capitalist crisis began in 1973 the working class share of output has been falling. The wealth gap is now a gulf. And the capitalist drive to revive profits demands most of us are paid even less. The old Labour movement has now largely gone and there is no virtue in trying to revive it. We have to build a new movement based on resistance and refusal to accept the rules of the capitalist game.